The Holocaust is the term usually used to refer to the genocide of about six million Jews in Europe during World War II. Holocaust was a state backed systematic effort of Nazi Germany to exterminate certain communities, predominantly the Jews. Scholarly opinion maintains that the term Holocaust should also entail the Nazis’ execution of millions of people other than Jews, such as, Soviet civilians, ethnic Poles, Romani, Soviet prisoners of war, people with disabilities, homosexuals, Jehovah’s Witnesses, and other political and religious opponents. By this estimation, the number of Holocaust victims raised to 11 to 17 million people in total. The execution of holocaust was carried out in different phases. The Nazi government had legislated to purge the civil society of the Jews before the World War II took inception. Concentration camps were created in which the detainees were subjected to unbearable toils and inhuman biological experiments until fatigue or disease killed them. Specialized units under the Nazi State killed Jews and political adversaries by shooting in groups in newly conquered territories of Eastern Europe. 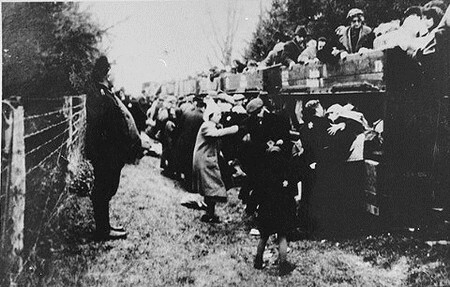 Jews and Romani were kept in overcrowded isolation before transporting them to concentration camps. Those who survived the journey were subjected to killing in gas chambers of extermination camps in a systematic way. Other prominent features of the genocide included seizure of territory and resources. It is argued that the leading motivation behind the perpetration of the Holocaust was entirely ideological —an imaginary world visualized by the Nazis, where Jews are sighted to have concluded an international conspiracy to command over the world resources in sheer clash with an Aryan (Nazi) mission. Every organ of Nazi Germany’s was bureaucratizing to provide for the logistics of the mass killing. Abridging the atrocities carried out in Holocaust, a scholar has branded Nazis Germany as “a genocidal state”. Saul Friedländer endorsed that ‘not a single religious community, scholarly institution, social group, or professional association in Germany extending through Europe showed any sign of sympathy with the Jews.’ He further describes that there were some Christian churches who could ONLY advocate that the converted Jews may be considered members of the Christian community but that too up to a point only. Friedländer propounded that the Holocaust was an event of idiosyncratic nature because, contrary to the norms witnessed in a modern society, the unchecked anti-Semitic practices prevailed for the first time in history without facing any likely resistance of stakeholders, such as entrepreneurial concerns, industry, churches, and other anthropological groups having vested political or communal interests. Why the Berlin Wall was Built?